Hualos Christ as featured on the Rochester Arts in Mission page. St. Mary’s Church, Green Street Green, is a treasure trove of creative arts. There is the beautiful stained glass window that members of the congregation designed and made, there are icons, collages, and altar rail cushions that pick up the same colours coming through the stained glass. The Art Group, led by the vicar, Rev’d. Karl Carpani and the principal artist, Marina Price, have clearly been very busy. Above the communion table, embedded in the wall, is a beautiful stained glass cross which, in the early morning sun, radiates colours of red, yellow and purple throughout the chancel. The empty cross is a powerful reminder of the resurrected and glorified Christ and in an iconic way, the St. Mary’s stained glass cross is a visual representation of the interaction between the Glorified Christ and humanity. 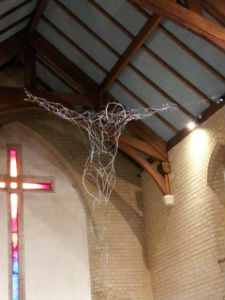 Partly inspired by the work of the sculptor Antony Gormley, Karl begain to explore how the cross could be used as a background for a sculpture of the crucified Christ. He began making sketches to scale in order to visualise the piece and explored using wire and nails as his material. He quickly realised that wire offered strength and stability and yet was flexible enough to shape and bend as required. The chancel is the darkest area of the church building and without artificial light there are only two small windows high up and the stained glass cross to illuminate the space naturally. The makes the wire sculpture almost invisible to anyone taking a quick glance. However, at certain times of the day the light from the windows and the stained glass subtly light the wire and the image of the crucified Christ seems to appear from nowhere, with the brilliance of the stained glass serving as a background. The two images of Easter, the Crucified Christ and the Empty Cross therefore combine to proclaim the suffering and the glory of Jesus.